When choosing a company, it is always essential to ensure that they are properly insured for the services they are actually providing as well as having adequate insurance limits. In the restoration and remediation industry, especially when dealing with Mold, Water Damage, and Bio-Hazards it is really recommended to have a minimum of a 5,000,000 dollar coverage in order to cover additional costs that may arise. Most contractors carry a 2,000,000 policy, however in this day and age that may well not be enough. In addition to requiring a prospective contractor for proof of insurance, it is also essential to ask for proof of WSIB Clearance. Without WSIB your contractor is operating illegally and you can be liable for injuries that could occur to the contractor or their employees. This is a link to the online portal to our WSIB page, you can check the status of our clearance here. 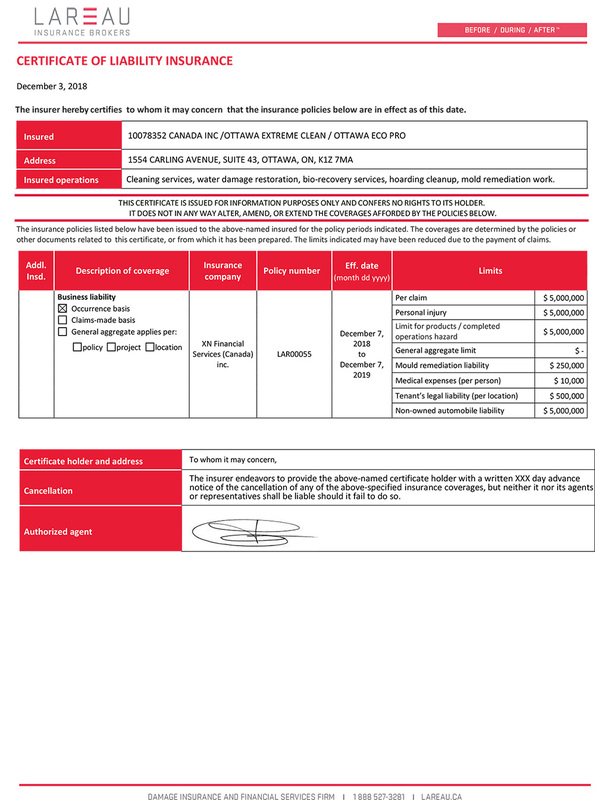 Here is a copy of our Certificate of Insurance showing our business activities as well as our limits. You can view the JPG. file or you can simply print out a copy of the certificate for your records.